It sounds a bit intimidating, doesn’t it? In fact, SEO is anything but—it’s not scary, it’s not a hack, and it’s not a marketing tactic. SEO is your secret weapon. And I can show you how to wield it! SEO targets the people who are already looking for YOU; you’re just making their job a little bit easier. And I can make your job a little bit (well, A LOT bit, actually) easier by showing you exactly how to do it—simply and authentically. As a digital marketing strategist, specializing in SEO, I can work with you or a team member one-on-one to set your company up for content marketing success. Together, we will use highly-targeted keywords and strong content to attract highly-qualified leads (in other words, your people) to your site. Together, we will find the future clients who are already searching for a company like yours. Have an SEO + digital marketing specialist on hand. Whether you need a dedicated SEO specialist for your growing company or want 1:1 training for a member of your team the Annual Digital Marketing Support plan may be the right fit for you. Projects depend on a variety of factors such as blogging frequency, competition in your industry, whether you have internal support to help implementation, etc. 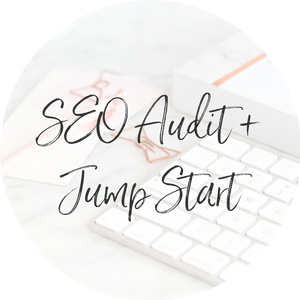 The SEO Audit + Jump Start is a unique combination of strategy, accountability, education + behind-the-scenes done-for-you support. INVESTMENT: Starting at $5,500. Payment plans available. SEO is one of the most highly-valuable marketing tools for your business. That is, of course, if you do it right. And I can show you how! Attract more of the right clients to grow your business easily and authentically through highly-targeted SEO. Would you like my help doing it? Good! That’s exactly what I’m here for. Not ready for custom SEO services? You can still learn SEO basics to start laying a solid foundation, all on your own. REQUIREMENTS: SEO for Solopreneurs is a self-paced course, but I highly recommend dedicating 6-12 hours to complete the course. Must have the self discipline and time to implement the SEO updates in order to see results. I'm excited to track my results when my new site launches, and I'm confident that I'll be able to make adjustments to improve my ranking based on what I learned in the course." By investing in SEO, you’re investing in finding the people who need what you have to offer . . .
making it all the more likely that they’ll invest in you. Don't see the right solution for your business above? Book a consulting session to talk about custom solutions. Schedule time on both of our calendars, and start connecting with your future dream clients today!